Epionce is a physician-strength skin care line rooted in hard science and integrates over 20 years of clinical skin research. 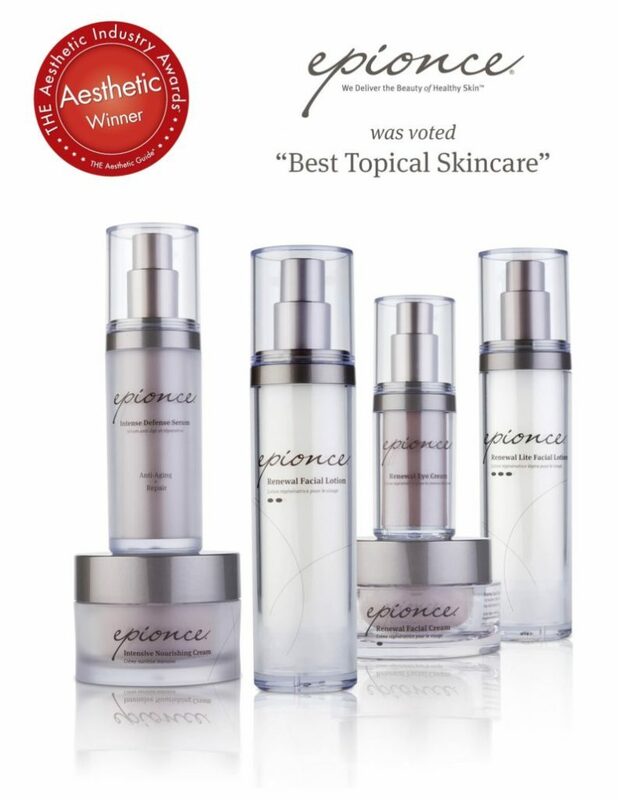 Epionce provides the foundation to address your unique skin care needs. From improving the visible appearance of skin aging to problem skin, Epionce has a regimen to solve your specific skin concerns. Epionce is formulated to help unleash the natural potential of your skin. Our unique approach provides a blend of key botanical ingredients to reveal healthier-looking skin that can help improve the visible effects of aging – giving you smoother, more radiant skin. Our gentle and effective formulas are paraben, fragrance, sulfate and gluten-free. Restorative botanical ingredients incorporate powerful multifactorial antioxidants along with barrier boosting cholesterol, ceramide and free fatty acids in proven concentrations to improve the overall health and appearance of the skin. Unlike many other products on the market, Epionce does not contain harsh ingredients that irritate the skin or cause unnecessary dryness. The result is healthier, younger-looking skin. Epionce Anti-Aging Lip Renewal is a powerful daily-use treatment formula designed specifically for the unique lip area. Soft-focus technology reduces the visible appearance of fine lines and wrinkles while revealing smoother, more hydrated lips. Renewal technology encourages healthier skin. Hydrates while smoothing and calming dry, flaky lips. A convenient take-home regime to care for the skin following moderate to deeper skin rejuvenation procedures. Quickly helps restore barrier function while providing a surge of hydration. Helps soothe and calm highly sensitized skin. The Essential Recovery Kit includes Milky Lotion Cleanser (30ml) Priming Oil (25ml), Enriched Firming Mask (30g) and Renewal Calming Cream (30g). Extra hydration for firmer looking skin. Helps soothe and calm irritating factors. Helps smooth and refine texture. Clinically proven anti-aging results against leading serums. Cosmetically elegant, non-irritating botanical formula. Removes stubborn dirt, oil and makeup. Cleanses without irritation or over-drying. Refreshes and calms problem skin. Helps reduce redness and problem skin. Visibly improves the appearance of imperfections. Smooths skin texture and tone. Penetrates pores to control acne blemishes. Proven to treat acne blemishes without dryness or irritation. Made with the same key ingredients as Epionce flagship Renewal Facial Cream but in a lighter formula for normal to combination skin types, Renewal Facial Lotion helps reduce the visible appearance of fine lines, wrinkles and other signs of skin aging. Expertly formulated to improve clarity and radiance for healthier-looking skin. Active complexes help reverse visible signs of aging. Hydrating formula for visibly smoother, tighter skin. Improves radiance for a healthy glow. Every day your skin encounters environmental aggressors that damage your skin. Everything from free radicals to pollution and ultraviolet light leave their mark on your complexion in the form of fine lines, dullness, age and sun spots. DCL Dermatologic Cosmetic Laboratories C Scape High Potency Serum 25 arms your skin with antioxidant protection to fully equip you with the tools your need to face each day. Powered by stabilized vitamin C, this daytime serum naturally brightens skin and improves elasticity to diminish the look of lines and wrinkles. Plus, it’s a rich source of antioxidants, so every drop arms your complexion with free-radical protection. Stabilized Vitamin C: jump starts collagen production and provides antioxidant protection. Exclusive Silanol Technology: stimulates collagen synthesis to improve elasticity and ward of lines and wrinkles. Amino Acids: reduce the depth and intensity of fine lines and wrinkles. Seaweed Extracts: boost elasticity to tone and lift skin. Hyaluronic Acid: attracts and retains moisture to naturally plump fine lines and wrinkles.Sugar Cane and Maize: soften, smooth and prevent dehydration. When you want a proven anti-aging system that produces results you can see, choose this set. This system contains seven products that are formulated to renew skin and fade fine lines, wrinkles and dark spots. The cleanser, toner and exfoliating product prepare the complexion for the anti-aging formulas that fade discoloration, smooth a rough texture and brighten the complexion. This Obagi Nu- Derm kit contains everything you need for a complete routine, morning and night. Hydroquinone brightens skin and fades discoloration. Sun protection ingredients defend against UV damage which causes signs of aging. This perfect for those with normal to dry skin. This intensely hydrating under-eye cream is an all-purpose solution to your common aging eye concerns. The formula helps tighten and firm sagging skin around the eye, minimize fine lines and wrinkles and alleviate dark circles and puffiness. It also contains malonic acid, a gentle exfoliator that helps to remove dulling dead skin cells, and a bi-mineral complex to help restore elasticity. The active ingredients are delivered deep into the skin via advanced Penetrating Therapeutics technology so that you can enjoy results in as little as two weeks. – Clinically proven to produce results in as little as two weeks. – Features an advanced delivery system for maximum benefits. – Protects against free radical damage. Powered by peptides and antioxidants, Obagi’s IDR Exfoliating and Hydrating Lotion effectively diminishes signs of aging, breakouts and visible pores. With a non-irritating and non-sensitizing formula, this daily moisturizer shrinks the appearance of pores and visible signs of aging by sloughing away dead skin cells. – Developed to improve the appearance of skin clarity and texture. – Minimizes the appearance of pores and visible signs of aging by gently exfoliating dull, old skin cells. – Dermatologist-tested, hypoallergenic, non-irritating, free of synthetic fragrance and paraben-free. – With regular use, IDR will reveal a healthier-looking and more radiant complexion. is designed to complement the skin’s natural nightly functions. This ultra-rich facial cream deeply hydrates to keep skin looking soft and supple. With continued use, this moisturizer also helps improve the appearance of fine lines, skin texture, firmness, skin radiance and overall hydration. – Shea butter, mango butter and avocado extracts moisturize skin. – Biomimetic peptides support the skin’s natural functions and minimize wrinkles. – Hydromanil provides immediate and long-lasting hydration to help skin retain moisture. – Leaves skin feeling and looking supple and firm. – Reduces the appearance of fine lines and wrinkles. – Provides hydration for up to eight hours. – Can be used by all skin types. SkinMedica AHA/BHA Cream improves the texture and tone of your complexion. With an advanced skin care formula, this product renews and rejuvenates your cells to create a youthful look. Alpha and beta hydroxy acids in this anti-aging formula exfoliate your complexion to smooth fine lines and wrinkles, fade discoloration and refine a rough skin texture. This anti-wrinkle face cream also contains nourishing ingredients that hydrate for a soft and luminous look. This brightening face cream contains exfoliating and hydrating ingredients for healthy skin. This product uses powerful natural ingredients to renew cells for a fresh complexion. Alpha hydroxy acids exfoliate to reduce the appearance of lines and wrinkles, beta hydroxy acids encourage cell renewal to fade dark spots and discoloration and soften roughness, Pro-Vitamin B5 binds moisture to the cells to keep skin soft and supple for a refreshed look. This fabulous product enhances the skin’s texture to promote a brighter, more youthful complexion. This exclusive retinol formula is encapsulated with an antioxidant complex, enhancing skin texture and minimizing irritation. It helps enhance skin tone, texture, and resiliency. With continued use, you’ll see a diminished appearance of fine lines and coarse wrinkles and an enhanced skin tone and texture. This revolutionary product conceals dark circles under eyes, diminishes crow’s feet and reduces puffiness. It also works to firm and brighten the eye area, helping you look more awake and alert. With a light, medium and dark shade, this concealer blends in to seamlessly match your skin tone. The sheer texture glides over skin without emphasizing fine lines or wrinkles.Also, Anti-Aging benefits. For daily skin maintenance and protection against dry skin. Theraplex HydroLotion is an ideal daily facial and body moisturizer that protects skin from the harsh, drying effects of the environment. HydroLotion delivers the benefits of an exceptionally rich and uniquely elegant “water-in-oil” emulsion deep into the skin without greasiness, tackiness or the use of emulsifiers which can cause further damage to sensitive skin. HydroLotion refreshes and hydrates skin, leaving it noticeably softer and smoother. Noncomedogenic. Free of Parabens, Fragrances & Preservatives. Our hydroquinone free skin brightener with Retinol, Kojic Acid, Azelaic Acid, Arbutin and Licorice extract exfoliates and refines the skin while inhibiting hyper pigmentation, including melasma. It re-textures the skin, helps reduce fine lines and wrinkles and improves skin clarity. This product promotes the correction of uneven skin tone, age spots and scars. Active ingredients include: Retinol, Kojic Acid, Azelaic Acid, Licorice Extract and Alpha Arbutin. Retinol assists in creating stronger, healthier skin cells and stimulates collagen production, increasing elasticity. Kojic Acid treats pigment problems and age spots. This product has a similar effect as hydroquinone. Kojic Acid also has antibacterial and antifungal properties. Azelaic Acid reduces inflammation and pigmentation. Licorice Extract reduces redness and treats atopic dermatitis. Alpha Arbutin is a pure, water soluble, biosynthetic active that promotes skin brightening and even skin tone on all skin types. Important Safety Information: If you use/used prescription products for eye pressure problems, use LATISSE® under doctor care. LATISSE® may cause increased brown pigmentation of the colored part of the eye which is likely permanent. Eyelid skin darkening may occur and may be reversible. Only apply at the base of upper lashes. DO NOT APPLY to lower lid. Hair may grow on skin that LATISSE® frequently touches. If you have eye problems/surgery, consult your doctor about use of LATISSE®. Common side effects are itchy and red eyes. If discontinued, lashes gradually return to previous appearance. Prevent thick, dark, raised scars with embrace® Active Scar Defense. Developed by world-renowned scar experts from Stanford University, embrace® is a one-of-a-kind scar therapy product. THIS INCREDIBLE PRODUCT TARGETS 15 SIGNS OF AGING ON FACE, NECK, AND DÉCOLLETÉ. See real results that improve over time. Micro-firming face massage lifts, tones and relaxes. Skin-changing sonic cleansing for face & body. Boosts the absorption of your anti aging products. Turbo button for power on-demand plus speed for long-wearing makeup removal. A makeup remover, skin improver and so much more. For all skin types – even sensitive. 2 facial cleansing speeds – delicate & universal. Clarisonic cleansing designed for men’s skin. Removes dirt, sweat & oil for healthier looking skin. Works on & under a beard.